The chain of Automation Quanta (AQ) generated by Internet Systematics is interpreted as the virtual Von Neumann architecture (VVNA) and thus we have an Internet Model. Let's see how the interpretation works. Initial development took place as the deployment of the STROWGER SWITCH replacing the manual operators of the telephone system. This form of automation, induced by the STROWGER SWITCH, implemented by elementary devices which influenced the construction of the Von Neumann Architecture. Gradually we arrived at the DIGITAL SWITCH the most basic component of the global Telecom network (PSTN). 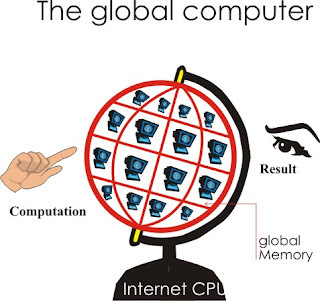 So we can bind all the activities which lead to the construction of ARPANET under the label Automation Quantum One (AQ1) This creates the infrastructure upon which to overlay ARPANET the first global computer network. 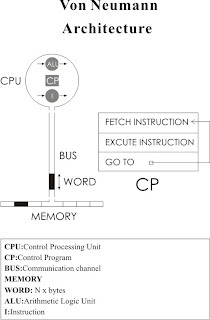 All ARPANET computers execute the NCP suite of programs constituting the virtual CPU of the global machine, their filesystems is the virtual Memory and the Telecom lines constitute the virtual BUS. So we can bind all the activities which lead to the construction of ARPANET under the label Automation Quantum One (AQ1).